The PTSA Raffle Committee is in great need of donations for the Senior Class Banquet being held on Wednesday June.20th. They are seeking donations of –but not limited to — jewelry, hair (both boys and girls), nail salon and tanning services, gift cards/certificates to local eateries, unlimited selections entertainment (movies, zip lining, amusement parks, etc) and shopping. Larger Items needed like mini fridges, printers, iHomes, iphone speakers, power chargers, Echo dots,College dorm items, Coffee Makers, Bed Bath and Beyond gift cards, Starbucks, Dunkin Donuts, or Amazon, Visa or Master card Gift Cards any denomination. Please donate your item before June 6th, 2018. The class of 2018 really needs your support. Items can be dropped off in the main office with Mrs. Dobi with “Kelly or Terri” marked on them. Please include your name so we can send a thank you. More information will be sent out the first week in May for all Seniors and parents related to Senior activities and graduation. At 10 am today, Joel Barlow students will be joining students from over 2500 schools nationwide in a walkout that will last 17 minutes. They will be walking out in solidarity and in memory of the 17 victims of the Parkland shootings, just one month after the Florida tragedy occurred. 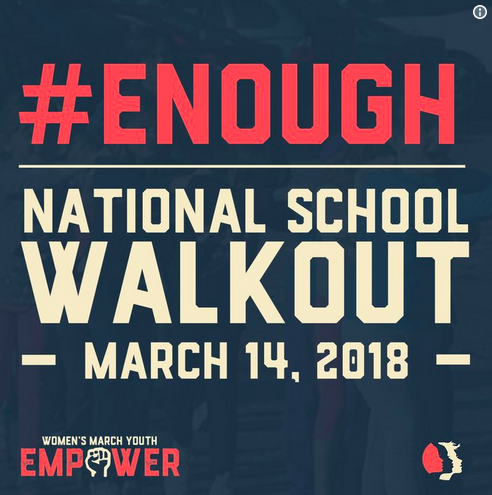 Organized by EMPOWER, the youth branch of the Women’s March, the event is called the #Enough Walkout. The nationwide protest is both a memorial and protest action, according to information provided by EMPOWER. The group facilitated the walkout by providing registered local student organizers with tool kits to guide them in organizing a walkout, communicating with administrators and an explanation explaining students’ rights. ER 9 administration is allowing students to leave the classroom to participate at their own discretion. Students that do not wish to participate will stay in class where teachers will continue to instruct. Schools like Barlow are attempting to strike a balance between interrupting the educational process and recognizing students’ desires and rights to participate in civil protest. Teachers are prohibited by contract from joining any protest on school grounds. Not all schools are cooperating with the protest and have forbidden participation, citing that according to school rules any student leaving the class to protest may face suspension. Although Barlow has similar rules, they are lifted in this circumstance. The Supreme Court has held that students at public schools have a First Amendment right to express their political views but schools also have a right to ensure that learning isn’t disrupted. Although part of EMPOWERs mandate is to draw attention and continue a national conversation on gun control and school safety, the Barlow event will center on a memorial for the fallen students. Barlow Student Council President Mackenzie Wenzel is the point person for the walkout. The H.S. Senior was pleased that the teachers, administrators and students she spoke to were proud that Barlow is joining these nationwide efforts. Here in CT, The Connecticut Association of Public School Superintendents (CAPSS) and the Connecticut Association of Boards (CABE) compiled a list of resources for member schools to follow for support, assistance and planning. Their letter may be found here. A few local parents are concerned that their children would be bullied if they did not join in. Wenzel said it is up to the individual student to decide if they want to participate and she hoped that any discussions on their choice would be a conversation and not a confrontation. There has been a concern that having a school registering on the EMPOWER site is a violation of state law, even if an individual student registered the school and not the administration. Attorney Deborah Stevenson notified the New Milford School District that the basis for the violation is that state and local public funds are being used improperly to advocate for a political issue and to influence how voters will vote. She urged New Miilford to cancel the event. Ms. Stevensons letter is here. New Milford High School will participate as planned. At Barlow, the weather may preclude having the students meet outside, so for safety the days weather will determine if they meet instead in the gym. According to Wenzel, music will be playing as the students gather. Poems will be read and the names of the 17 victims will be remembered. At 10:17, students will return to class. Age appropriate remembrances will be planned for the middle schools. Some students felt that the event was being micromanaged by the administration and with their desire to keep it non political, saying it wasn’t so much of a walkout as a school sanctioned and arranged event. Wenzel responded that although she and her team have worked closely with Dr. Gina Pin, Barlow Head of School, it is a student lead initiative. 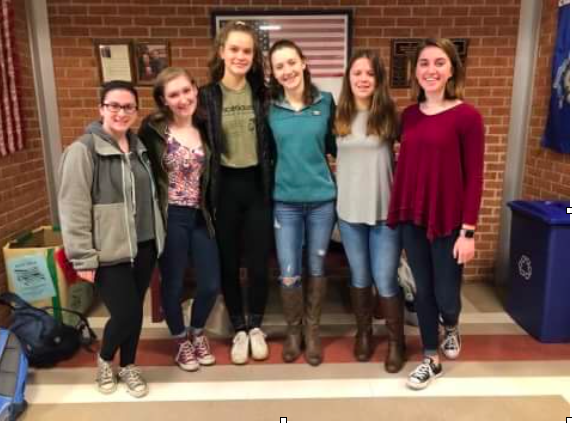 Wenzel has enlisted the help of fellow students Theresa Galban, Veronica Galban, Maddie Migliorino, Riley D’Agostino , Emma Boland, and Anna Speck to help coordinate the event. The challenge has been maintaining the incredibly difficult balance of what the students want, what the rest of the nation is doing, and the parameters of Joel Barlow High School. For security and safety concerns, the Redding Police will have officers stationed at all road access to Barlow, including the front drive and Turney Road. Those not affiliated with a school may participate in “March For Our Lives,” in Washington, D.C. on March 24, with satellite events taking place across the country and internationally. There will also be another school walkout on April 20, to mark the 19th anniversary of the Columbine shooting. The following students have art displayed in the “Teen Visions” Art Show at Sacred Heart.